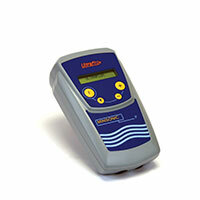 Accurate and robust, the Minisonic 2000 measures flows of all qualities of water, refined/crude petroleum products and different chemical products. A single chord unit includes at least one converter and two probes with supports and cables. The dual chord versions (two speed measurements on the same pipe) are used to overcome hydraulic disturbance. Drinking/raw water: Measuring flow rate in water supply networks, measuring flow rate and metering in treatment works, supervising networks, monitoring processes, etc. Waste water: Measuring flow rate in pumping stations, in networks, at purification plant intakes/outputs, etc. Raw water: System supervision , flow measurement in fire mains, etc. Energy: Penstock monitoring (Hydro Electric), water metering for air conditioning, etc. Chemical products: Managing networks, measuring the flow rate of acids, chlorides, etc. Hydrocarbons: Flow measurement in fuel distribution systems, flow measurement in multiproduct pipelines, etc. Click the following link for Minisonic 2000 explosion-proof page.